Explore the Tops Weekly Ad Circular. 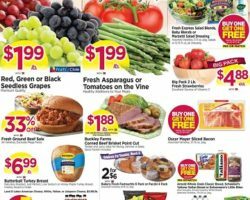 Get this week Tops Markets Ad Sale Prices, printable coupons, flyer sale specials and organic grocery promotions & offers. Tops is a chain of grocery stores that traces its history back to the early 1920s. The business was established by Ferrante Castellani who opened a neighborhood store in Niagara Falls, New York after moving here from Italy. It was only in the 1950s however that the company started to develop and expand, opening the first Tops supermarket in 1962 – a modern store aimed to offer customers top shopping experiences. Tops today operates a network of more than 160 full-service supermarkets, serving the areas in Upstate New York, Vermont and Northern Pennsylvania. Tops supermarkets carry a number of popular departments, including produce, bakery, meats and seafood. The supermarket is known to sell Alaska Seafood products such as crab, salmon, cod and halibut. Alaska Seafood has a reputation for sourcing natural fish using sustainable approaches. In addition to offering lower prices for brand name products through the Tops Sale Ad, the company provides further money saving opportunities through its store brand that features quality foods from day to day essentials to frozen foods, dairies and meats. Save with Tops Weekly Ad Circular.